Tuesday, January 9th @ 7:00PM – Only $23.95 per seat! The show’s over, folks! This concert has already past. ? Stay tuned for our next season’s concert series! Johnny Counterfit, comedian/singing impressionist, presents a musical show that features voice and singing impressions of some of the most famous singers and actors of yesterday and today, along with voices of politicians of past and present, all packaged in a clean comedy and music style, with a live band. His show features country music, but is not limited there. Some of his impressions include Johnny Cash, George Jones, Earnest Tubb, George Strait, Garth Brooks, Vince Gill, Frank Sinatra, Dean Martin, Julio Iglesias, plus Presidents Clinton, Bush, Reagan, and Nixon, and also actors George Burns, and Edith & Archie Bunker! His impressions are exact and are not an exaggeration for comedic purposes. For comedy, he adds jokes and humor between songs or during the actor/political portion of the show. 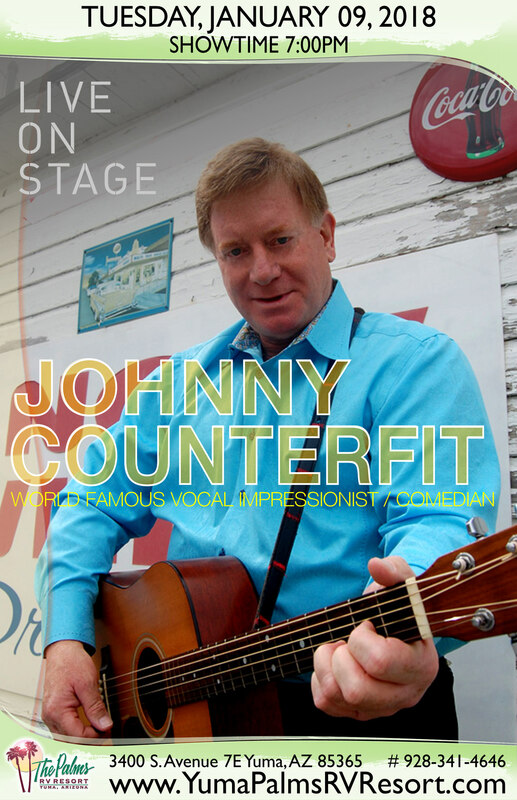 Johnny Cash remarked after hearing Counterfit`s impression of the country legend, “He`s the best I`ve ever seen!” Counterfit discovered his God-given talent for voice impressions at the early age of five in his hometown of Portland, Oregon. He realized that he could recreate voices heard on television while watching cartoons. Throughout elementary and high school, the young entertainer would perform voice impressions of singers, actors, and politicians for family members, teachers, and fellow students. At seventeen years of age, Counterfit began to perform professionally with a band at a local night spot called, “The Nashville West,” on “open-mic” Sunday. Over the years, Johnny developed a following of fans, and decided to utilize his talents toward a full-time career in “showbiz.” A life-long dream came true for Johnny in 1994 when he was asked to make his first appearance on the GRAND OLE OPRY. He continues to be a guest on the show as audiences are repeatedly thrilled by the talents of this celebrity. TNN, “THE NASHVILLE NETWORK,” regularly schedules Counterfit for guest shots on various programs throughout the year, and has been on previous programs, such as: COUNTRY`S FAMILY REUNION; MUSIC CITY TONIGHT, with CROOK & CHASE; PRIME TIME COUNTRY; and OPRY BACKSTAGE. His repeated exposure on television has resulted in a vast growth of notoriety worldwide.